Strong bridges are marvels of engineering, but they’re also metaphors for solid partnerships built on mutual respect and a sense of shared adventure. Researchers at UNH are currently enjoying the fruits of two of many such successful ventures with their state and municipal partners: one involving the restoration of a Dover watershed, the other, well, an actual bridge — Memorial Bridge, connecting Portsmouth, N.H. and Kittery, Maine. Erin Bell, chair of the department of civil and environmental engineering, helps the Memorial Bridge come "alive." When Memorial Bridge, the first gussetless bridge in the country to support traffic, underwent an $80 million renovation in 2012, an innovative project made sure it was able to do more than carry cars. Outfitted with monitoring equipment and dozens of sensors, the bridge allows UNH researchers and the New Hampshire Department of Transportation (NHDOT) to turn 1,200 feet of hulking steel into a “Living Bridge,” as the project has been named. 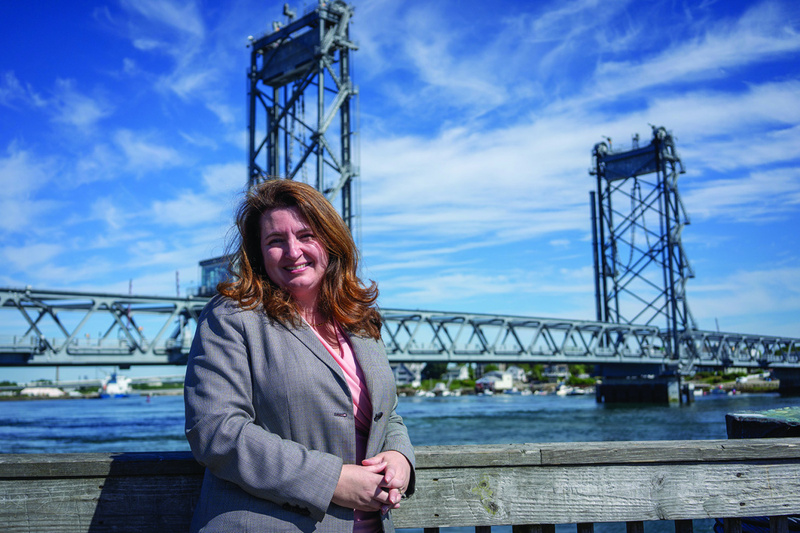 “With bridge construction, you typically don’t learn anything unless something goes wrong,” says Erin Bell, UNH associate professor of civil and environmental engineering. “We wanted to reverse that process and learn all we could from it from the start.” Bell, along with ocean engineering professor emeritus Ken Baldwin and Martin Wosnik, associate professor of mechanical engineering, worked with Ann Scholz ’11G, research engineer with the NHDOT, to learn all the things that a bridge might teach — in New Hampshire, Maine and across the nation. The National Science Foundation-funded project uses data gathered from the bridge’s sensors to run thousands of trials, effectively, “testing our model to the point of failure so the inspectors can say, ‘OK, let’s keep our eye on this or that section,’” Bell says. In addition to evaluating the health of the bridge, investigators are keeping an eye on the river beneath, thanks to sensors placed in the Piscataqua’s chilly waters to measure current, turbidity, conductivity, temperature, salinity and other estuarine health indicators. A turbine harnesses tidal energy to power the bridge's instruments. Wosnik says Memorial Bridge demonstrates what a sustainable bridge could look like in the future. “We could have powered the project in a number of ways,” he says. But his team wanted to demonstrate that an estuarine bridge, built where the river is narrow and tidal currents are fast, “could use tidal energy as a locally available renewable and sustainable energy source” to power the bridge’s instrumentation. 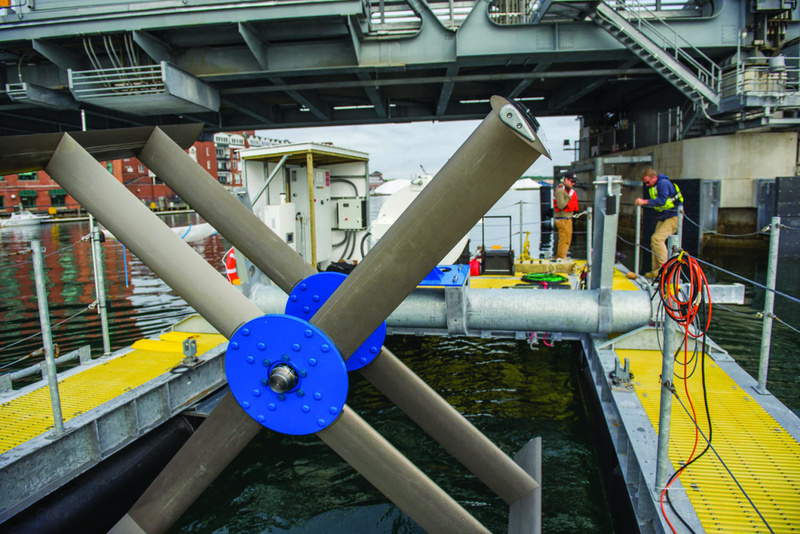 So, with funding from the U.S. Department of Energy, Wosnik’s team, which includes UNH undergraduate and graduate students, built a turbine deployment system from which they can lower a 10.5-foot diameter turbine into the Piscataqua from a 50- x 20-foot platform attached to the bridge near the Portsmouth side. Scholz, whose department helped the project secure funds to build the platform and for the structural sensors, says the project is a “first” for New Hampshire and the nation. “The Living Bridge powerfully showcases our state research program and how we’re looking at ways to improve our practices here,” Scholz says. 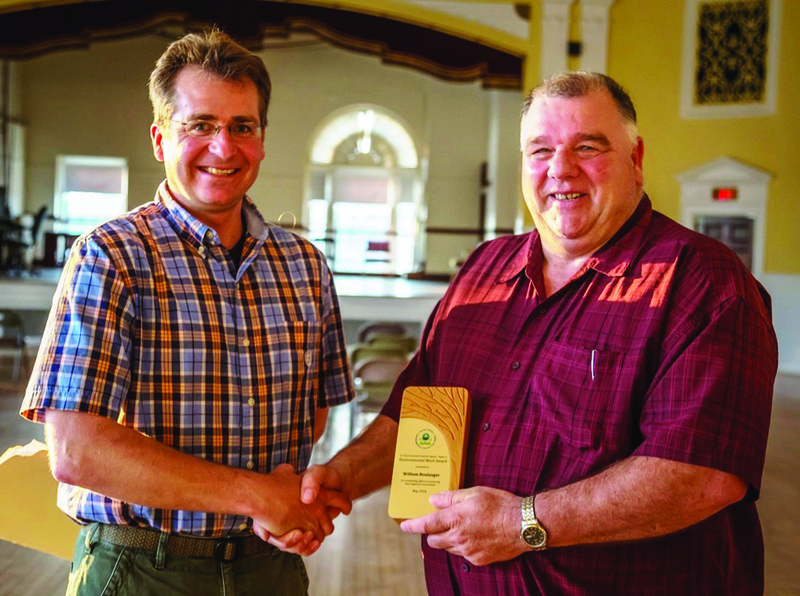 Jamie Houle and Bill Boulanger's success with Berry Brook marks the beginning of a new approach to managing water. Meanwhile, upstream from the Living Bridge project, UNH Stormwater Center program manager Jamie Houle ’95, ’15G and Bill Boulanger of the small seacoast city of Dover have been assessing another “first:” their 10-year project to restore the Berry Brook watershed. That was the scenario facing Boulanger, Dover’s deputy director of community services, when he contacted Houle in 2008. At the time, Houle and his colleagues were itching to extend their research in stormwater management beyond the university into field sites in the region. Berry Brook gave them their chance. Through a series of grants from the N.H. Department of Environmental Services and matching funding from the city of Dover, this project implemented some best practices from UNH research, customized to the operation and maintenance expertise of Dover’s public workers. “Stormwater run-off that normally flowed untreated into the stream was diverted to catch basins and rain gardens that cleaned the water and infiltrated it back into the ground,” says Houle. At the same time, more than 1,000 linear feet of the stream that had flowed underground was brought to the surface. The result? Impervious cover was reduced to an impressive and sustainable level of 10 percent. Today, Berry Brook is recovering, meeting its federal regulatory goal of reducing pollutant loading of suspended sediment. Houle and Boulanger emphasize that their success with Berry Brook marks the beginning of a new approach to managing water, one that can be applied locally to watersheds around the world. “The southern part of New Hampshire is expected to grow 26 percent in the coming 30 years. Yes, this shows we have a vibrant community, but it also signals a need to learn how to ease the pressure off our water systems,” says Houle.